Responding to customers on social is no longer a luxury, it’s essential to the success of your business. Around 67 percent of consumers in the U.S. now turn to social media for customer service requests. Brands that deliver on these expectations are winning out—both in terms of customer advocacy and year-over-year revenue growth. But it’s not easy. It requires a dedicated team ready to answer questions and resolve issues within hours, all with a friendly tone that reflects your brand voice. Right now there a few brands leading the pack on the customer service front, going above and beyond for their customers on social. Their successes show why customer service should be a key part of your social marketing strategy. Named by Fast Company as one of the most influential brands in the e-commerce retail space, Warby Parker has completely changed the way we buy eyewear. Their secret? They offer trendy glasses and fast, effective social customer service. Warby Parker has a ‘Home Try On’ program that allows you to sample different pairs of glasses. By Tweeting at Warby Parker with the hashtag #HomeTryOn, Warby Parker will offer tips on which pair to choose. The Warby Parker team has also set up a Twitter handle, @WarbyParkerHelp, where they answer customer questions and help with any issues. They consistently get kudos from their customers on their awesome support. Online mattress retailer Casper is killing it on social. They won a Shorty award for the “The Tweeting Mattress,” a series of hilarious late-night, sleepy-time Tweets. Their witty social media convos have landed them coverage in articles like Buzzfeed’s 32 Tweets About Sleep that Will Make You Laugh Out Loud. Their unique brand voice informs their customer service efforts. @wsstefan how was night 1!? Casper has a self-admittedly “over-the-top” customer service model and uses social media to “deliver customer happiness.” (It doesn’t hurt that they have a fantastic return policy.) After a purchase, for example, they follow up with customers to ask how they enjoyed their night’s sleep. Growing their Twitter following tenfold in a year, Casper knows how to improve their customer’s experiences on social. If you dread grocery shopping every week, chatting with Whole Foods on Twitter might help. In addition to delicious recipes, healthy food tips, and great user generated content, they’ve got an awesome customer support team on social. Let's check with your local store! Where do you shop? When customers reach out with issues or complaints, they respond quickly and resolve issues immediately. They also reach out to individual stores on behalf of customers when things are not available at the store or when a customer has a bad experience. Their global brand of 4 million Twitter followers focuses on giving their customers a more personalized experience through local accounts. Their strategy? Everything centers around the customer. Spotify knows how to treat its customers right on social. Winning a Webby Award for social media customer support, Spotify goes beyond traditional customer service to make their customers happy. For example, they have a “Random Acts of Kindness” program where they surprise customers by sharing a song or playlist based on the person’s unique music tastes. They also have a dedicated handle @SpotifyCares, where they share helpful advice, get customers in touch with their tech team, and respond quickly to questions in several different languages. Canadian telecommunications service provider Telus is known for its fast, efficient customer service. our support teams are aware of the issue and working to fix it as soon as possible. Their dedicated handle, @TELUSSupport makes it quick and easy for anyone to figure out how to reach them and when to expect a response. They’ve got their customer service hours conveniently posted in their Twitter bio, and post a sign-off Tweet every evening to let their customers know that they will be offline until the following day. Image via TELUS Support on Twitter. 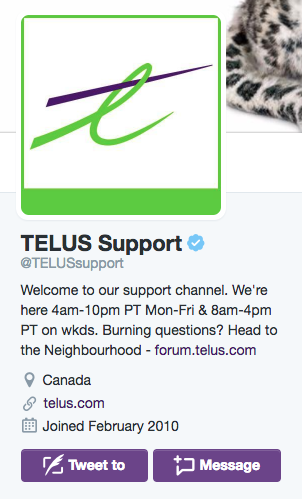 Telus also knows when to take issues offline in order to properly resolve customers’ issues while maintaining privacy. Starbucks is known for it’s quick responses and great service on social, making it easy for customers to ask questions about store offers, drink menus, and contests. You're so sweet! Your friend does not need to be with you while you order, you can bring it to her. They’re also turning the traditional customer suggestion box on its head. With their handle, @MyStarbucksIdea, Starbucks holds an open forum for customers to offer up ideas and suggestions with everything from drink selection to store layout—to offer customers the best possible in-store experience. It’s a great way for a global brand to offer an accessible channel for people to give their feedback. The @MyStarbucksIdea account connects to a dedicated website, where customers can vote for their suggestions. What started as a necessity to keep customers posted about flights has now turned into a full-fledged social customer service program where KLM is dedicated to giving customers the best possible experience. You’ve probably heard that great customer service on social is directly tied to revenue. Well, KLM knows exactly how much. Their awesome social customer service program generates about $25 million in annual revenue—handling around 70,000 queries each week in 14 different languages. Their helpful staff, quick responses, and hourly updates on flight statuses ensure that customers continue to book flights with KLM. Social customer service isn’t slowing down. To keep up with the pace of customer demand, you need to develop a social customer service strategy. Follow the lead of these awesome brands to come up with new and creative ways to engage with your audience on social. Find and resolve social support messages quickly and efficiently with Hootsuite. Learn more about Hootsuite’s social customer service solutions and request a demo.